Jojoba "oil" is actually a wax. It is a more expensive oil and is frequently blended in a small dilution with other oils. 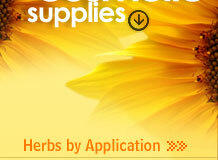 It has a very long shelf-life and is the closest to the skins own naturally occurring oils. The first record of jojoba is from 1701. Father Junipero Serrra found that Native Americans were using Jojoba to treat sores, cuts, burns, as a conditioner and for all over skin and hair treatments. Jojoba (pronounced "ho-ho-ba") is an evergreen shrub found in the Southwestern, United States, Israel and Argentina. Plants in the wild usually range in height from three to 15 feet and are believed to have a longevity of 150 to 200 years. The jojoba oil is extracted from the seed of the plant. 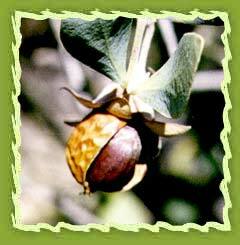 Female jojoba plants produce a seed that contains 40-60% liquid wax. Jojoba oil is composed of liquid wax esters which make up 26-30% of our skin's surface layer called sebum. Chemical constituents: Jojoba oil has various chemical compounds that include chained C20 and C22 fatty acids and alcohols and two unsaturated bonds, which make the oil susceptible to many different types of chemical manipulations. The extracted oil is relatively pure, non-toxic, biodegradable and resistant to rancidity. Extraction: It is extracted from the cold pressing of the seeds. Jojoba Oil can help heal acne, athlete's foot, cuts, mouth sores, pimples and warts. The oil also helps to remove build up around hair follicles. This enables it to help with dandruff, hair loss and dry scalp. In skin care Jojoba oil seems to be readily absorbed. It will not block pores. It seems to help moisture loss. When used as a moisturizer it tends to soothe wrinkles and lines due to dry skin. The skin may appear more supple and feel smoother and softer. Jojoba oil is a wonderful eye make-up remover. Jojoba is the highest grade certified organic, cold pressed oil. It is bright and golden in color and is regarded as the most favored in the carrier oil family used for fragrance because of its advanced molecular stability. It makes a great scalp cleanser for the hair. Jojoba oil has many attributes that make it highly attractive to the cosmetic and skin-care industry. The oil has acceptable skin-feel properties and excellent moisturizing ability and also it is very stable and gives products a long shelf life. Jojoba oil is used in hand or body care lotion. It can be used as a makeup remover. It is used against sunburns. Jojoba oil has been used to promote hair growth and relieve skin problems for centuries. It is effective in treating dandruff, dry and chapped skin. It is also very good for sensitive skin types. Jojoba oil is called liquid gold because it is nourishing to the hair and skin while hydrating. It is also one of the few oils that can break up years of crusted build up on the scalp that can cause follicle blockage. Jojoba also has potential use as biodiesel for cars and trucks, as well as a biodegradable lubricant. In industry it is also used as extenders for plastics, printer's ink, gear-oil additives etc. It is a fast migrating lubricant for small movable parts such as: locks, bikes, power tools, clocks etc. This renewable natural resource replaces sperm whale oil for industrial uses. It also renews vinyl and leather. It act as a natural furniture polish. It is used in making jojoba butter, refined wax, carrier base for medications requiring topical application, printing ink, a low-calorie edible oil, insulation for batteries and electrical wires. Jojoba wax beads can be used in soap bars, shower gels and lotion bars. It gives a natural colored spots to the soaps and a nice soft exfolliant base. It can be added for the moisturizing properties of jojoba and also add a pastel tint to the bars and balms.